Welcome to Amsterdam Canal Guest Apartment. Your own quiet place right in the city center. Amsterdam Canal Guest Apartment is part of a historic canal house right in the center of Amsterdam, on a beautiful location overlooking the Amstel River, walking distance from all you want to see and explore. This newly designed studio apartment has a private entrance and includes a kitchenette with a small dining table, a double bed (Auping 160 x 200 cm), a walk-in closet, and a separate modern bathroom with a full bathtub/shower combination. The kitchenette has a microwave, refrigerator and an automatic coffee maker. 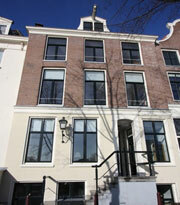 The Hermitage, Rembrandt house, famous Flower Market and Kalverstraat shopping area are all within a 5-minute walk. Amsterdam Canal Guest Apartment is 300 m (0,2 miles) from the Waterlooplein metro station, just 2 stops from Amsterdam Central Railway Station. This is a perfect quiet location on the canal right in the middle of the heart of Amsterdam.